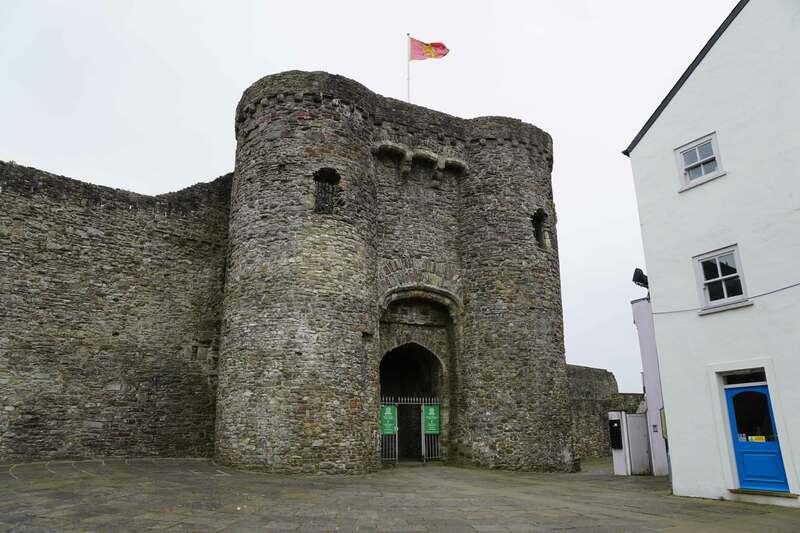 Carmarthen Castle became a Royal property in the early twelfth century and was used by the King to ensure he had a strategic base amongst the territory of the Marcher Lords who otherwise dominated South Wales. It was attacked on numerous occasions by the Welsh and was regularly upgraded. The castle was slighted after the Civil War to prevent further military use. The Normans invaded England in 1066 and within a few years had firmly established their control across the country. However, at this time Wales was not a unified political entity and was instead a series of independent Kingdoms whose power and influence fluctuated depending upon the strengths of their respective rulers. Accordingly there was no centrally co-ordinated Norman campaign to conquer it during the late eleventh/early twelfth centuries. Instead Norman Barons were encouraged to seize land and forge autonomous Lordships providing they took the responsibility for securing and suppressing the area. These so-called Marcher Lords were nominally subject to the King of England but were effectively defacto rulers in their conquered lands. By the early twelfth century such men had carved territory for themselves throughout South Wales - Roger de Montgomery, Earl of Shrewsbury had secured Pembrokeshire, Henry de Beaumont, Earl of Warwick had conquered Gower and Robert Fitzhamon, Baron of Gloucester had overrun the Vale of Glamorgan. These Lordships now commanded vast resources far from Royal oversight prompting Henry I to seek his own domain within South Wales in order to assert his authority. He chose Carmarthen, a site that had previously been a Roman fort and walled town, which was centrally located between Pembroke and Gower. Carmarthen Castle already existed by the time Henry I decided to take control of the area. It was been built no later than 1094 by William fitzBaldwin on top of a steep buff overlooking the bridging point over the River Tywi. The castle took the form of an earth and timber motte-and-bailey fortification. The motte was topped with a timber palisade and round tower. There were two baileys - the rectangular Inner Ward housed the main domestic and administrative functions whilst the smaller Outer Ward may have been used for livestock. This early castle was attacked by the Welsh in 1116 but withstood the assault and a town was founded soon after. In 1135 however Henry I died and this led to a period of contraction in Norman influence in Wales as the Barons became distracted in the subsequent power struggle - and later Civil War - in England. The Welsh exploited the situation and mounted an attack on Carmarthen Castle in 1137 where they successfully captured it. 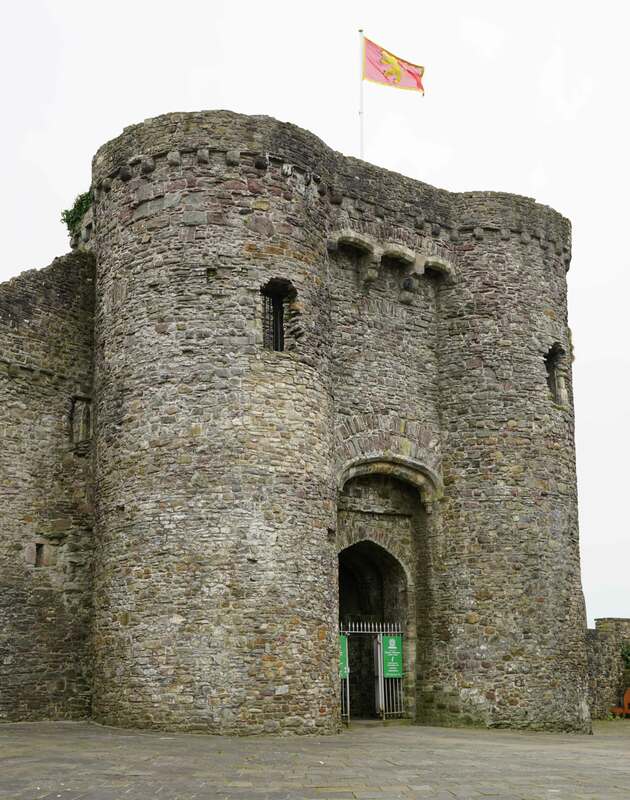 The castle was retaken by the Normans and in the latter half of the twelfth century was one of just two castles in South West Wales (the other was Pembroke) that resisted the forces of Rhys ap Grufford, Lord Rhys. Extensive modifications were made to the castle between 1181 to 1183 as a result including adding a circular stone tower on top of the motte. The majority of the castle remained timber however for in 1215 it was again attacked by the Welsh and partially destroyed. The castle then remained in Welsh hands until 1223 when it was recaptured by William Marshal, Earl of Pembroke. Carmarthen Castle was substantially rebuilt thereafter. In particular the timber palisade around the top of the motte was rebuilt in stone creating a shell keep. The curtain wall around the Inner Bailey was also rebuilt in stone and five large towers were added along its line. Work was probably largely complete by 1233 when work on the town wall commenced. An attack by the Welsh, culminating in a three month siege, was successfully resisted at this time. Since the castle's re-capture by William Marshal, Carmarthen had been held by a variety of English magnates. It was retaken back into direct Crown control in 1241 and was subsequently augmented by a range of new domestic apartments suitable for a Royal visitor. This coincided with the rise of Llywelyn ap Gruffudd who, after having defeated his Welsh rivals, sought to expel the English from Wales. 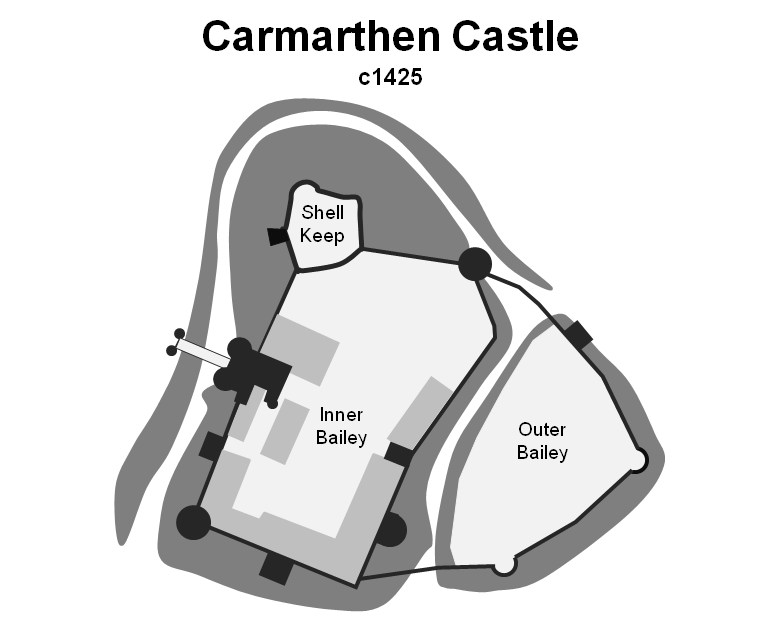 Carmarthen itself was attacked in 1244 and 1246 although the castle withstood both assaults. Henry III sent an army to the site in 1257 but this force suffered heavy casualties from the Welsh. Eventually Henry was forced to acknowledge Gruffudd as Prince of Wales at the Treaty of Montgomery (1267). Henry III was succeeded by his son, Edward I, in 1272. He initially confirmed the agreements of his father but, when Gruffudd failed to pay homage, Edward invaded. The First War of Welsh Independence (1276-7) saw the English war machine rampage through Wales. Whilst the main (Royal) assault was launched from Chester, additional forces also advanced from Montgomery and Carmarthen. Gruffudd was defeated and stripped of his lands east of the River Conwy. An uneasy peace followed until the Second War of Welsh Independence (1282-3) during which Edward I conquered the whole of Wales. Carmarthen Castle was again a key operating base from which Royal forces operated. Under Robert Tibetot, the English army advanced from the castle up along the Tywi Valley but were defeated at Llandeilo. This was the only Welsh success however and at the Battle of Orewin Bridge (1282), Gruffudd was killed. The English overran all of Wales and reorganised it into English-style counties. Carmarthen Castle became the administrative centre of Carmarthenshire with Robery Tibetot appointed as Justiciar. His heavy handed rule prompted a rebellion by Maredudd ap Rhys in 1287. From his base at Dryslwyn Castle, he attacked Carmarthen town and burnt it to the ground although the castle withstood the attack. Edward I cemented his control of Wales with substantial new fortresses and Carmarthen Castle itself was also upgraded. This included rebuilding the Outer Bailey curtain wall in stone and adding new administrative and residential buildings. A new barbican was added by 1317 as were small turrets to the Outer Bailey. Despite these upgrades the castle surrendered to the forces of Owain Glyndŵr when he attacked in 1403. The castle was re-captured by Henry IV and garrisoned but it was attacked and taken again in 1405, this time by a large Franco-Welsh army. It was recaptured by the English the following year and, as the rebellion petered out, the town wall was extended. Owain Glyndŵr's rebellion was the last major uprising against English rule and Carmarthen Castle exclusively became an administrative site. This changed with the outbreak of the Civil War in 1642. Wales was predominantly Royalist but Parliament had control of the Navy and in 1644 landed a force to seize Carmarthen Castle. It was soon recaptured by the Royalists and thereafter the town and castle were enclosed by an earthwork rampart (part of which still survives). 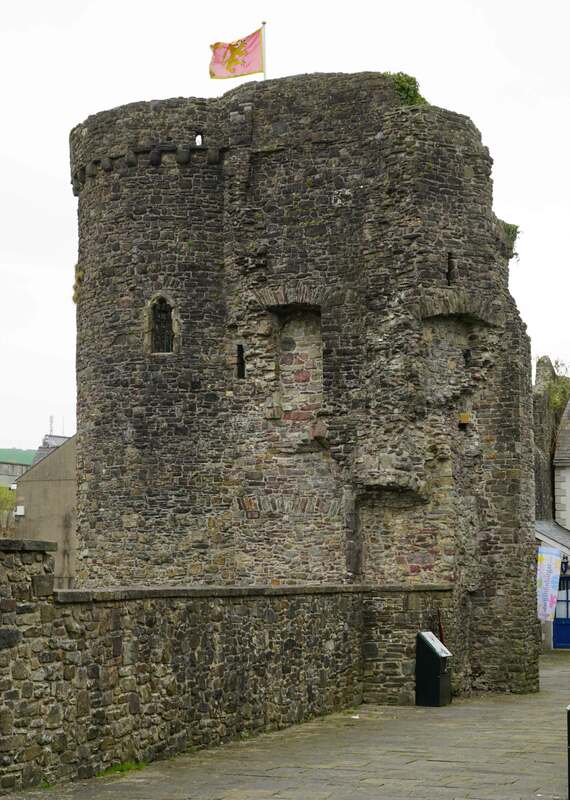 As the Royalist caused waned, Carmarthen Castle surrendered to the Parliamentarians and was subsequently slighted to prevent further military use. After the war the ruined castle was modified to serve as the county gaol. The facilities were dreadful and they were upgraded between 1789 to 1792 to meet the enhanced standards promoted by the penal reformer John Howard. 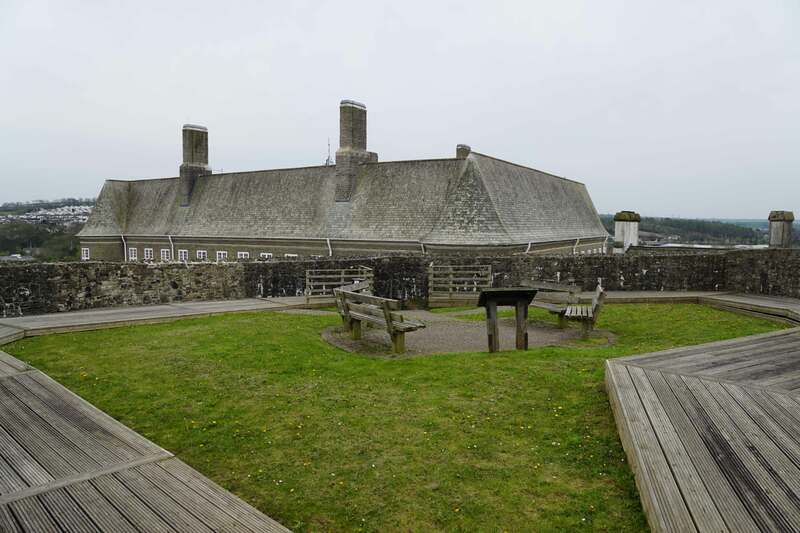 A further substantial rebuild occurred in 1868 and this remained in use until 1922 after which prisoners were instead incarcerated at Swansea gaol. 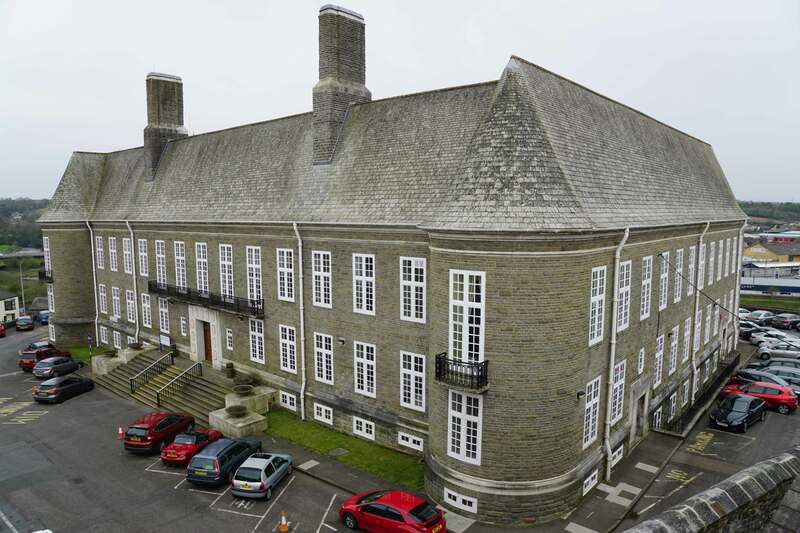 In 1933 the old gaol at Carmarthen was demolished to make way for the County Hall which was built straddling the former Inner and Outer baileys of the medieval castle. Salter, M (1991). The Castles of Gwent, Glamorgan and Gower. Malvern. Much of Carmarthen Castle has been demolished and the site is now dominated by the 1930s Carmarthenshire County Council building. 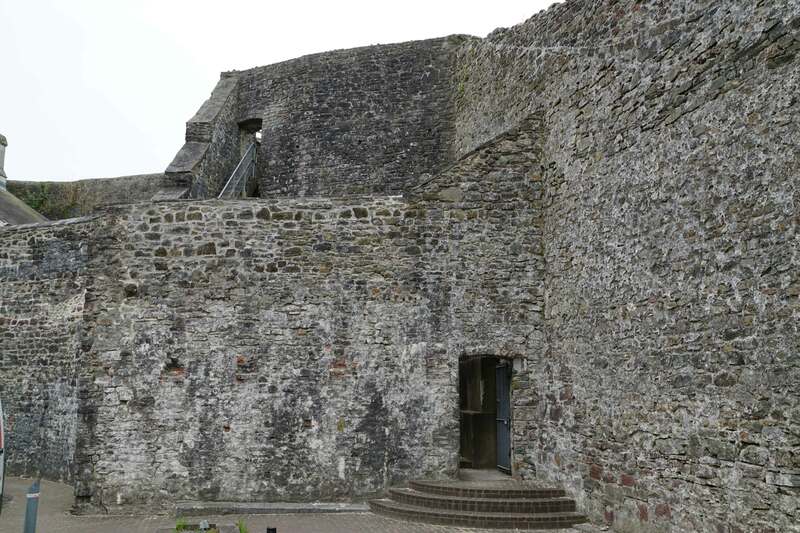 Nevertheless the Shell Keep, the Gatehouse, portions of the curtain wall and a number of towers survive. There is also a surviving earthwork bulwark from the defences built during the seventeenth century Civil War. Carmarthen Castle. The castle was built with two baileys but the main access was always directly into the Inner Bailey. Gatehouse. The gatehouse was built in the first half of the thirteenth century on the site of an earlier timber version. Shell Keep. The castle was raised as a motte-and-bailey castle and was dominated by a timber tower on top of the mound. This was rebuilt in the 1230s into a stone shell Keep. 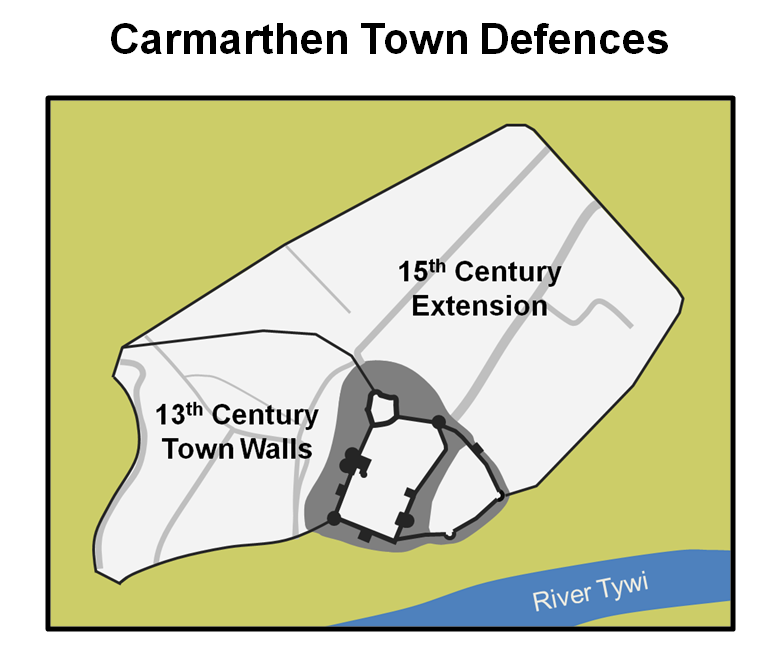 Carmarthen Town Defences. The town walls were built in the 1230s and were substantially expanded after the rebellion of Owain Glyndŵr. The site of the Roman fortified town was to the north-east of the fifteenth century walls. Carmarthenshire County Council. The large building straddles the site of the Inner and Outer baileys of the medieval castle.